Mobile devices now account for nearly 2 of every 3 minutes spent online, and 72% of workers say they do at least some of their learning on a smartphone or tablet [Degreed, How the Workforce Learns]. This is good news for organizations who are making the most of this trend. Degreed has recently released substantial improvements to its mobile app, bringing the native iOS and Android experience more in-line with the functionality of Degreed’s web application – making it even easier for L&D to make learning an everyday habit. Here are 5 reasons to get excited about the Degreed mobile app. This is one of my favorite things about the Degreed mobile app. As soon as you install the Degreed app, you can get credit for what you’re learning from other apps, like online videos and articles, and podcasts you listen to. Simply share these items with the Degreed app to get credit, save the item for later, or recommend it to someone else. Run a full search of your organization’s internal catalog or search Degreed’s library of 3m+ external resources – both from inside the mobile app. You can get the complete profile view for your own profile or see others’ profiles from the mobile app. You can see items you completed or the completed items of those you follow. You can also modify your learning interests to further personalize the experience in Degreed. 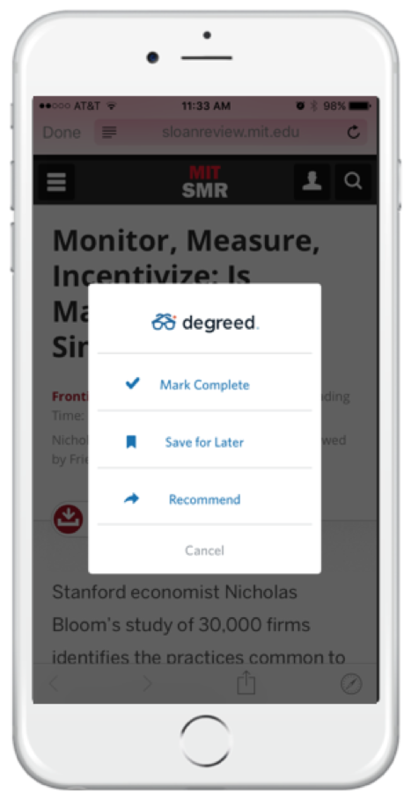 You can now customize both the Degreed site and the mobile app for your organization. The Degreed mobile app supports push notifications for recommendations, which can be configured by the user. Push notifications will appear even when the app is closed. Nowadays, having a mobile-enabled learning solution is critical. Check out the Degreed mobile app for IOS or Android, or get the mobile experience by just loading the Degreed site from any device, and start getting credit for everything you learn, no matter where or how you learn it.